Did you ever wish you could be in a movie? Not just see a movie, but actually be in it? Well, you can. It's easy. No acting experience is necessary. And it's totally free. What's the catch? There is none, really. Movies are shot on location all the time in L.A., and they need people - lots of people - for those crowd scenes that you see all the time in films. Your only problem is finding out where and when these movies are being made, so you can be in them. And for the producers, their only problem is finding people who want to be in their films. Fortunately, that's no longer a problem. A Hollywood agency named "Be in a Movie" makes its money by solving both problems, by bringing together the people (like you) who'd like to be in the movies with the producers who need them. In short, they round up crowds for big movie scenes. 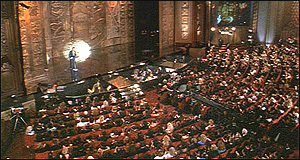 Val Kilmer crowd scene in "The Doors"
Jim Carrey crowd scene in "Man On the Moon"
For instance, remember the crowds rooting on "Seabiscuit?" 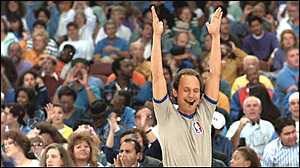 as he thundered down the stretch? BeInAMovie.com provided those crowds, and you could have been one of them. 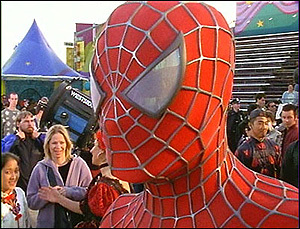 Remember the excited crowds in "Spider-Man" when the Green Goblin attacked the World Festival? BeInAMovie.com provided those crowds too. As well as for the films "Dodgeball", "Anger Management", "Rocky", "The Bodyguard", "The Doors", and many more. Crowd from the final scene of "Rat Race"
The people who make up the crowds are called "unpaid extras" in the trade. When a big crowd scene requires thousands of people, Hollywood can't afford to pay union wages to all of them - so they look for volunteers who want to participate just for the fun of it. That's where you come in. If you're not a full-time working extra (they get paid), but you would like to be on the set when they shoot a big movie near you, this is a great opportunity to see big stars in person. We're talking the likes of Jack Nicholson, Jim Carrey, Adam Sandler, Tobey Maguire, Billy Crystal, Samuel L. Jackson, Chris Rock, Whitney Houston, Richard Gere, Val Kilmer, Whoopi Goldberg, Ashanti, Martin Lawrence, Tommy Lee Jones, Christopher Lloyd, Burt Reynolds, Raven, Kirsten Dunst, Sylvester Stallone, Ben Stiller, Vince Vaughn, Dean Cain, Kevin Costner... All of these stars (and many more) have appeared in front of crowds booked by BeInAMovie.com. Which means you not only have a chance to see a major star in person, and a chance to watch him (or her) making a movie, but you also have a chance to see yourself later, up on the Silver Screen when the movie is released. Of course, there are no guarantees about that. Sometimes the directors does close-ups of the people in the crowd, and other times they keep it at a wide-shot, but if nothing else, you'll have fun looking for yourself in the film and telling your friends that you're actually in the movie! I first encountered just such an opportunity when I was a youngster, way back in 1976. MGM was filming the re-make of the movie "King Kong", and took out an ad in the newspaper asking for people to be part of the crowd for the big scene where Kong breaks his chains and escapes. It gave me the chance to see Jessica Lange in person (back before she was a big star), not to mention Jeff Bridges, Charles Grodin, and a 50-foot tall mechanical version of King Kong himself. 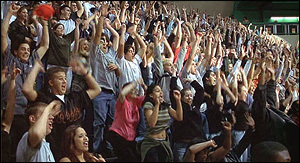 I still look for myself in the crowd scenes every time that movie comes on TV. 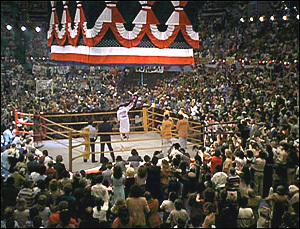 Billy Crystal and crowd, in "Forget Paris"
Sylvester Stallone & crowd in "Rocky IV"
I found out about BeInAMovie.com when I helped design their website. It's amazing how many stars they've worked with, and how many chances they've provided for the public to see stars in person. Don't get me wrong, they're not doing this for out of the goodness of their hearts. The studios pay them to provide the crowds for these big scenes. But they go out of their way to make sure the crowd gets treated well and has a lot of fun - and what really matters is that you get a chance to be in a major motion picture. How exactly do you do go about being on the set? It's easy. First, check their website at http://www.BeInAMovie.com, scroll down and see if they have a new movie coming up soon. They probably will. (Most of their films are shot in the Los Angeles area, but they also do shoots in other locations, including New York, San Francisco, Austin, Kentucky... wherever the scene requires.) Then all you have to do is sign up to be an extra in the film. No red tape, just give them the basic info (name, email address, etc.) and they'll make a reservation for you. Later, they'll email you detailed instructions on where the movie is being shot, where to park, what to wear, etc. If you'd like, you can also put your name on their email list, so they can let you know in advance when a new movie project is on the horizon (often several times a year in the L.A. area). Of course, there's no obligation, and no cost - you only sign-up for the movies that interest you. When the filming day comes, all you do is park where they tell you, ride a shuttle to the filming location, and take your place in movie history. The only drawback to being in a movie is that the actual filming is often a slow, drug-out process. Directors can do multiple takes of the same shot, with long waits in between. But the BeInAMovie staff helps keep things moving, with raffles for prizes, entertainment, food, etc. If you're in the Southern California area, it's definitely worth doing at least once. You'll never look at the movies quite the same way again.